Sometimes recycling can feel a little monotonous as an adult, but to kids it can be very exciting! There are way to teach kids about recycling that make it fun for them. Not only will it help them to be more responsible for the environment, it can help you to teach them responsibility in general. Recycling is a great teaching tool in homeschooling, personal finance, and of course overall responsibility! Recycling doesn’t need to be boring. Teach kids about WHY we recycle. Work on a recycling project and walk your kids through the steps of the recycling process. Paper mache projects are always a fun way to share about recycling paper. We also love the fact that recycling cans is a fun way for them to earn a bit of money! Yes! There are so many fun online games that teach kids how to recycle. In an electronic world, sometimes it does take a few recycling “games” for kids to get it! If you are looking for a great way to entertain your kids with something educational, this is the place to look. Just like some adults don’t “get it” not every child understands what happens at a recycling plant. Taking a tour of a plant allows your children to see how recycling is done. Not everything that’s recycled is done the same way, which is why it’s important to walk your children through the steps. If you don’t have a recycling plant nearby, you can at least stop by the local landfill or recycling station where they collect materials to recycle. This will give your kids a place to see exactly what materials can be recycled. Not everything that’s recycled is thrown into a recycling bin. If you really get creative, there are so many things you can teach your kids to recycle. Make a project out of recycling an old pallet into furniture or make a string of lights out of old plastic pop bottles. The options are truly endless. We have tons of fun upcycled crafts in our DIY section here, and one of my good friends has even more fun projects at Thrift Diving! Most garbage companies have recycling bins to use when it comes to picking up recyclables, but there’s something fun about making recycling bins for around the house. Get really creative and create recycling bins out of recyclable material. Make one for paper, plastic, glass and aluminium. You’ll be surprised at how much less actual garbage you have when you start recycling everything you can. You can even create a compost bin for food scraps. 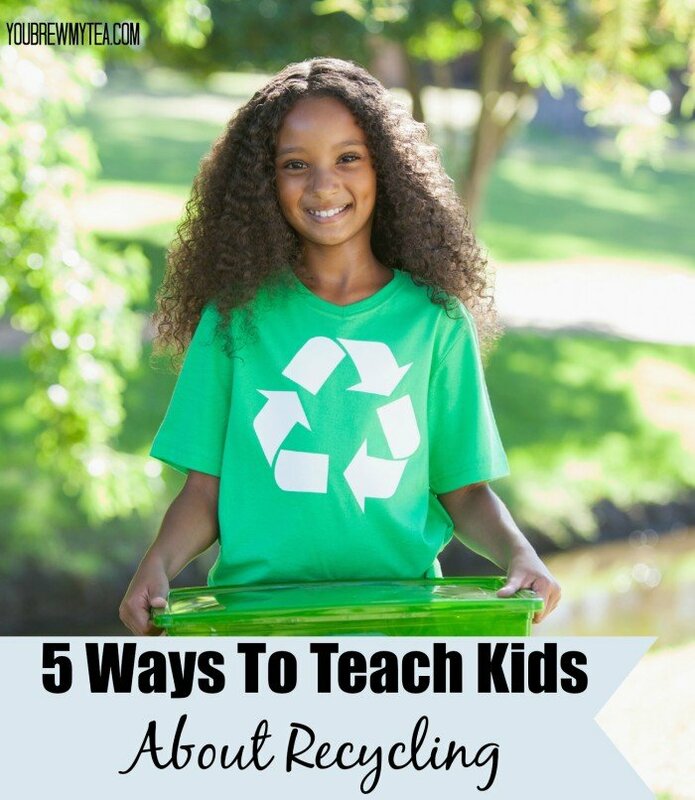 There you have it, five ways you can teach your kids about recycling. It’s important to go through the steps on “why” recycling is important! Finding ways to recycle and reuse can help save our planet and it begins in households just like yours! Check out some other great things to do with kids!